All the major pharma companies are showing growth, both in the all-important US market and at home. Big is getting bigger in the global pharma industry. Israeli giant Teva Pharmaceutical Industries acquired the generics business of leading US player, Allergan, for $40.5 billion in July. Mylan N.V., which is now domiciled in the Netherlands with operational headquarters still out of the US, is pushing for a $33-billion hostile takeover of Ireland-based Perrigo, a maker of over-the-counter cough and allergy remedies. There have been a number of other M&As among US-based pharmacy chains or pharmacy benefit managers - intermediaries between drug companies and insurers - in the last few years. Will such consolidation impact the strength and influence of other players in the long term, especially Indian pharma companies operating in global markets? It is a difficult question to answer, but there are no such signs yet. On the contrary, most leading Indian pharma players have been growing in the all important US market - for many, their largest source of revenue. 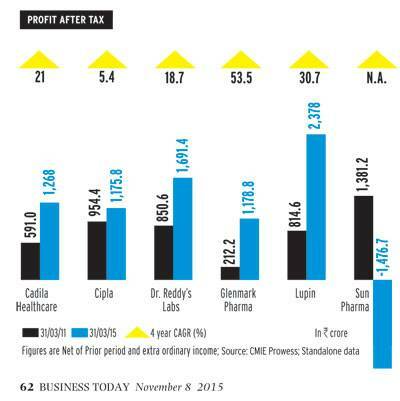 Around 47 per cent of Dr. Reddy's Laboratories' revenues in 2014/15, for instance, came from the US, as did 45 per cent of Lupin Ltd's. (Only about 20 per cent of the revenues of leading Indian pharma players come from the domestic market.) Indian pharma companies have succeeded in holding their own so far mainly because they have moved up the value chain in time. They have long had a global reputation for making cheap generic drugs, but many have since moved beyond plain vanilla generics. "The migration of Indian companies to higher, value added generics has made a difference," says G.V. Prasad, Co-chairman and CEO, Dr. Reddy's Labs. "The US remains a major growth driver." Value added or complex generics are those which are difficult or expensive (or both) to manufacture, with some even requiring clinical trials. They have limited competition and thereby provide scope for higher margins. One of the companies, Sun Pharma, has even gone beyond generics. It pulled off the one big merger that has taken place in India too in recent times, completing its $4 billion takeover of Ranbaxy Laboratories in April last year (2014) to become the country's largest pharma company. To add to its proprietary knowledge and strengthen its US presence, it is also acquiring US-based InSite Vision, Inc. for $48 million through one of its subsidiaries. InSite Vision focuses on specialty ophthalmic products, and currently has three such in advanced stages of development. In June, Sun Pharma inlicensed Xelpros, preservative-free eye drops for glaucoma patients, developed by its own research organisation, Sun Pharma Advanced Research Co (SPARC) for the US market. But the company is yet to get the US Food and Drugs Administration (USFDA) approval. Other Indian companies have made acquisitions in the US too this year, though these have remained in the traditional generic segment. In July, Lupin announced the acquisition of US-based GAVIS Pharmaceuticals - a niche generic drug specialist - for $880 million, its sixth acquisition in 18 months. And in September, Cipla Ltd acquired two US generics companies, InvaGen Pharmaceuticals and Exelan Pharmaceuticals, for $550 million. Brokerage firm CLSA's report on Indian pharma in August 2015 singles out Sun Pharma and Dr. Reddy's for special praise. "Complex product launches by Sun Pharma and Dr Reddy's over the past three years have delivered strong results, indicating that Indian players can move up the value chain," says author Alok Dalal. "The US differentiated-product contribution to Sun Pharma's sales and profit is eight per cent and 16 per cent (respectively), which could rise to 16 per cent and 26 per cent by 2019/20." Sun Pharma acquired a majority stake in US-based Taro Pharmaceutical in 2010 and took over another US company, DUSA Pharmaceuticals, in 2012. The report predicts that the three together could emerge as a strong force in the US's dermatology and complex injectables markets. "We expect the company to launch its novel psoriasis drug Tildrakizumab (specialty product) in the US in 2017/18 with sales of $200 million by 2019/20," it adds. As for Dr. Reddy's, the report expects its differentiated products in the US market to contribute 33 per cent to its profit by 2019/20 from the current 13 per cent, with skin and central nervous system treatments as the main growth drivers. "We expect biosimilars to be a growth driver (for Dr. Reddy's) beyond 2019/20," it adds. About other pharma companies, Dalal is more restrained. He notes that Lupin has advanced through its acquisition of GAVIS, but maintains Cipla - which gets only eight per cent of its revenue from the US - has a long way to go. "We upgrade Cadila Healthcare from 'underperform' to 'outperform' as its differentiated products pipeline can generate long-term returns," he adds. Glenmark Pharmaceuticals too has filed three product approval applications in the US for immunosuppressants, apart from building on its niche strength in oral contraceptives, dermatology and oncology injectables. Indian pharma companies have had their run-ins with the USFDA in the past, notably two years ago when the latter banned entry of drugs manufactured by leading companies such as Ranbaxy and Wockhardt Ltd at specified plants, claiming the plants fell short of its quality standards. But the situation seems to have vastly improved. 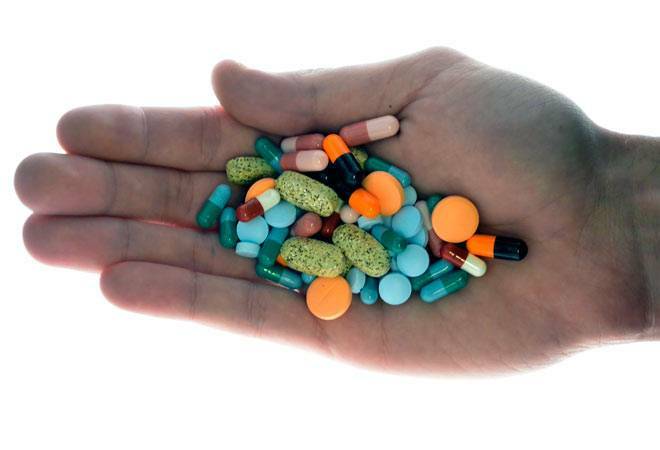 A recent Bank of America Merrill Lynch report by Manoj Garg, research analyst, DSP Merrill Lynch (India), shows that there were 75 approvals of Indian drugs by the USFDA in the April to September15 period this year, against 75 in the entire financial year 2014/15. "Clearly, one of the reasons behind the recent growth has been an acceleration in product approvals by the USFDA," says Glenn Saldanha, Chairman and Managing Director, Glenmark Pharma. "Indian companies also now understand the US's market better, both the kind of compliance required and the filing and product quality needed." The depreciation of the rupee since 2011, making Indian pharma products cheaper, has also worked to the industry's advantage, as the Bank of America Merrill Lynch report notes that a five per cent rupee movement would have a 2.4 to 5.6 per cent impact on pharma universe's earning per share. Another industry estimate maintains that for every one per cent fall in the rupee's value against the dollar, the EPS of leading pharma companies increases by 0.7 per cent. According to the report, Cadila Healthcare, Aurobindo Pharma and Lupin have been the biggest beneficiaries of depreciation. Strategic partnerships have also helped some companies - notably Cipla's tie up with Teva which made it sole supplier of the generic drug Nexium (esomeprazole magnesium) in the US. 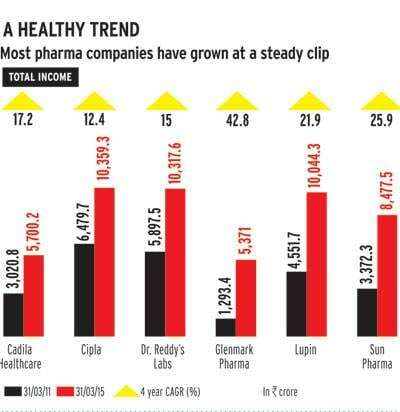 In the $15 billion domestic market too, Indian pharma companies have been showing steady growth. There were many apprehensions when the National Pharmaceutical Pricing Authority passed a new Drug Price Control Order (DPCO) in May 2013, increasing the number of drugs under price control from 74 to 348, but these have been belied. The order itself took into account market realities, changing the formula for calculating drug prices from the former 'cost plus' approach to the more realistic 'market-based pricing' approach, and linking prices of the listed drugs to inflation, so companies would not have to seek government permission each time they needed to raise prices. Prices of some formulations did indeed have to be reduced, but this affected the MNCs operating in the country more than the wholly indigenous ones, since the former's prices are usually higher. Pharma companies have been growing within the country through select product acquisitions, marketing alliances and greater penetration. Dr. Reddy's has been particularly proactive in doing so - in April this year it finalised a Rs 800 crore deal to buy up some of the brands of Belgian pharma giant UCB being distributed in India. The brands chosen will strengthen Dr. Reddy's presence in the dermatology, respiratory and paediatric segments. In May, it entered into a distribution agreement with the Indian arm of the UK-based AstraZeneca, to sell two of its trademark products, Riax and Riax M, within the country. In August, Dr. Reddy's announced a strategic collaboration with leading biotechnology company Amgen to market three of Amgen's drugs related to oncology and cardiology. The industry is also benefiting from a rapidly expanding market in certain chronic disease segments like diabetes, brought on by widespread lifestyle changes. Despite the buoyant mood, a few concerns remain. A number of emerging markets such as Russia and its surrounding CIS countries, Venezuela, Brazil and South Africa are wracked by currency turmoil far greater than what the rupee faced. Most leading pharma companies have about 15 to 20 per cent of their revenues coming from these countries. Dr. Reddy's and Glenmark Pharma, for instance, have a good deal of exposure in Russia and the CIS countries as well as Venezuela. Analysts, however, maintain the companies concerned have imposed tight controls on their expenditure, taking the volatility into account. Future price regulation, be it in India, with more drugs being brought under the price control order, or in the US, is another worry. US Presidential hopeful Hillary Clinton's recent tweet, condemning the ill conceived attempt by US based Turing Pharmaceuticals to raise the price of one of its drugs by 5,000 per cent and vowing to oppose it, sounded ominous to some industry watchers. But overall, most feel the good times will continue. "This is one industry that thrives on challenges," says D.G. Shah, Director-General, Indian Pharmaceutical Alliance (IPA). "It is creative not only in discovering treatments and cures, but also in getting out of tight corners."